On December 12, Michelin presented its prestigious restaurant guide for 2017. A lot of top chefs eagerly gathered in a tiny room to hear whether they received a star, lost a star, or remained starless. At the same time, there are chefs who were once in that room, but now prefer to disconnect from the red book, which has been inventorying the best restaurants in the world for nearly a century. This happens especially often in Flanders. Jo Bussels emailed Michelin a few years ago to say Michelin should not give him a star under any circumstances. Shortly after, Christophe Van den Berghe refused a star and Frederick Dhooge gave back his star two years later. Meanwhile, Jason Blanckaert—one of the Flemish Foodies—traded his life as a star chef to start a business that was more accessible, and chef Vincent Florizoone told me in an interview that Michelin should never come to him, because it would spoil—rather than enrich—his restaurant. 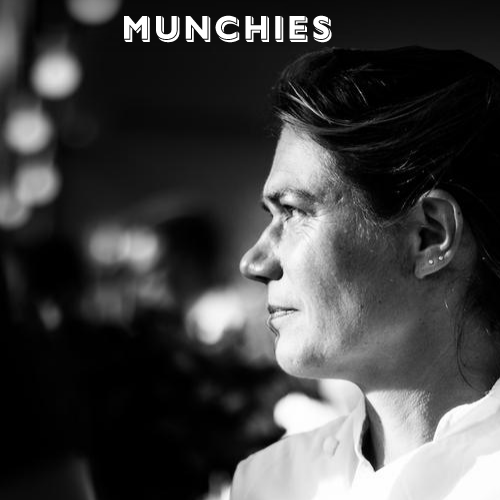 Last week, Karen Keyngaert, the only female Michelin starred chef of Flanders, announced that she will give back her Michelin star. She is going to start a new restaurant with exclusively female staff and she doesn’t want her star there. I called her to ask her why she gave back her star, and how it is to work with a team consisting of only women. MUNCHIES: Hi Karen! How long has your restaurant A’Qi had a Michelin star?Karin Keyngaert: For five years now. I got it two years after opening. Why do you start your new restaurant without a star in March? Until ten years ago, a Michelin star was a blessing, but in these economic times it is more of a curse. People go to star restaurants just to go for a festive occasion, to dine long and extensive, but personnel costs have become so high that it’s unpayable. Guests will also come with a different expectation. They expect certain products, such as lobster or lamb, but as purchase prices rise they find it difficult to accept that the prices of the menus are going up as well. People now go for dinner in another way: casual, quick, just for fun or a quick bite. A star increases the threshold of your restaurant, which means people will not get to enter as easily. In my new restaurant, the food remains the same, but the formula for offering it will change. I continue to serve quality food, but not as a [set] menu, so people can decide for themselves how expensive or long they want their dinner. And I’m going to stop with all the frills! What kind of frills do you mean? The star brings along a whole circus that’s outdated. If there’s even a crease in the menu card or a crease in the tablecloth, people soon end their sentence with: “I don’t think that belongs to a star restaurant.” Hanging up jackets for the guests, the clothes waiters wear, the white gloves they wear when they put silverware on the table … I myself don’t attach any importance to it when I go out to eat, so why should I keep this type of restaurant open? You lose the freedom to do what you want as a cook when you do this. This summer, someone called me to ask if her husband could please come in shorts, because of an accident. Who am I to say he can’t? I don’t want to get those calls anymore. I don’t want people to come eat there because the chef has a star, but because it’s a cozy place. People have to be able to come as they are, just to have a nice conversation with good food. I want a restaurant where I would like to go out to eat myself, so I attract the kind of people I seem to feel comfortable with. Therefore it’s also called Cantine Copine. I want to create the feeling that people go to their best friend’s to eat, in a casual atmosphere, a place where they know where the refrigerator is, so to say. And that concept won’t qualify for a star. Street food stalls and sushi bars get Michelin stars outside Europe, right? Yes, but here Michelin continues to play the traditional card. Therefore, it was quite a weird edition here last November. There’s a whole new generation of chefs who think in a different way. They do their own thing in a different way, but do not qualify for a star. Other chefs, who very clearly created a concept with the intention to obtain a star, are eligible. I once tried to contact them and that’s a real mission. You can send a letter by mail to “the director of the Michelin Red Guide” because nobody knows his name, and just hope that it ends up in the right place. But I never got an answer. The only thing you can do to get rid of your star is by not filling in the form when you receive another one again. It’s a pity, because the original idea of Michelin was fantastic: they sold tires and gave a guidebook with it so you could find restaurants if you went driving around. But people now travel and find other ways to discover places to eat. The guide has not kept pace. I read that you want a restaurant with a team consisting of only women. Why? It happens to be the case that I currently only have women in my team—two in the kitchen and one in the ministry. I’m going to take them with me. Is it better to work with just women? There is a notable absence of testosterone. It’s much quieter and there’s less competition. I personally find it enjoyable. I can’t tolerate all the messing around and I can do without all the macho behaviour as well. Was it difficult to lead a team of men as a woman? It depends on the personality of the boys and their age: the older, the more ambitious, and thus the harder to stand my authority. Once there was a cook in my kitchen that was very domineering and arrogant. He was twice as big as I was, so physically I wouldn’t stand a chance, certainly not in a kitchen full of large knives. I had to fire him. How come there are so few female chefs? I think women take on their ambition in a different way than men do. Men like to take the lead, and it’s still true that women have to take care of their families more than men. That’s difficult to combine with working in a restaurant. I’m different from the other women, because I don’t have a classical household to take care of. Furthermore, it’s not that I want a kitchen with just women. This is accidental. When I search for new employees, I don’t look at the gender, but at their personality and competence. This story originally appeared in Dutch on MUNCHIES NL.